Fly west from California for 5 hours. Change planes in Hawaii and continue west for another 7 hours or so. Turn right in Guam and head North for half an hour or more. You wont be disappointed. Saipan is a beautiful island with a lot to offer. On this web site I welcome you to see my pictures and videos taken around the 14 mile long by 5 mile wide island and decide for yourself. I decided to make this web site when I tried to find pictures and short descriptions of various places in the world that my wife and I may want to vacation. All I could find were internet businesses trying to sell me something. There is nothing to buy on this site and I'm not trying to sell anything. Click on a picture under the menu on the right to explore interesting places in Saipan. Below are some of my miscellaneous videos that didn't seem to fit on any of the other pages. The video below is about the Boonie Dogs of Saipan which are descendants of American WWII military dogs. In Saipan, the military did not need the big attack dogs but needed the sniffer dogs to find the Japanese hiding in the caves. Since WWII, the once heroic combat dogs mixed together and became what we now call Boonie Dogs. The Boonie Dogs seem to be a mix between Bloodhound, Labrador, Rottweiler, and German Shepard. Do you notice another breed mixed in these dogs? Today their population is out of control and they are literally starving to death on the streets. "Poolside Show" A Tahiti show by the pool in Saipan. Trying my skills as a combat photographer in the middle of a laser tag battle with my kids. This is a lot of fun and I'm not sure who enjoys it more, my kids or me. This is the same location where the Marines landed on the beach of Saipan in WWII. "Mouse Hunt" The thrills of living in the tropics. Good ol Stewie is great in the jungle hunting down 500 pound bombs but he was sure a baby when it came to this mouse hunt. This reminds me of trying to evict the 8 inch spider that moved in to our kitchen. "1918 Banzai Weapon in Saipan! How?" I found this today at the site of the largest Banzai charge ever near Tanapag. A few weeks ago the Japanese bone collectors were excavating part of the trench where the Americans buried well over 2,000 Japanese from that attack to collect some of the bones. They collected the bones and artifacts and then filled the trench back in. We located the secret locations and simply walked around the area. We had heavy rains since they filled in the trenches so many of the bones and artifacts that were missed were uncovered by rain and were laying on the surface. At first we were excited thinking that this was the handle of a Japanese sword since it was buried in the trench with Japanese soldiers and their weapons. I was completely dumbfounded when we took a wire brush to it and "U.S. 1918 L. F. & C.-1918" quickly appeared. How did a 1918 American WWI weapon used in the trenches of Europe end up in the hands of the Japanese in Saipan, the other side of the world, nearly 30 years later? In short, this was made in America for the trench warfare of WW1 Europe. By the time these were produced, WWI ended so the U.S. put these in storage. In 1942 and 1943 these were issued to the recently formed "Marine Raiders" to do small scale island operations behind Japanese lines. By 1944, before the battle of Saipan, they needed large scale attacks so the Marine Raiders were incorporated into the 4th Marines who later invaded Saipan. The Marines complained about this knife because the blade would brake off at the handle. The Marine who used this knife would also complain but since it was found right at the front line where over 2,000 Japanese died and more broke through the line, the Marine who used this knife most likely did not survive. "WWII Banzai Trench" A quick walk around the site of the largest Banzai charge ever near Tanapag in Saipan. A few weeks before the Japanese bone collectors were excavating part of the trench where the Americans buried well over 2,000 Japanese from that attack to collect some of the bones. They collected the bones and artifacts and then filled the trench back in. We located the locations and simply walked around the area. We had heavy rains since they filled in the trenches, so many of the bones and artifacts that were missed were uncovered by rain and were laying on the surface. By the end of our walk around, my exploring partner had quite a collection of live bullets. He collected them to dispose of properly so that the kids will not find them and take them apart to play with the gunpowder, which was very common when he was a kid. Also excavated in this trench were 250 live Japanese hand grenades. A few days later the Japanese bone collectors returned to Saipan to meet me and have me show them around. I took them to several caves that still have Japanese remains. I also told them about these bones that we found so they can include them in their next bone collection and cremation. Today was a real honor for me to show the Japanese bone collectors around to some of the caves that I documented which still have WWII Japanese soldier's remains. "Stewie the Explorer" Today I thought I would make a special video for my little exploring buddy, Stewie. 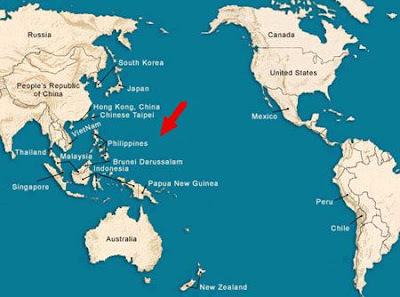 In the mid 1990's the military realized a need to have large pre-positioned supply ships stationed around the world, including Saipan. These ships would take a couple months to get this far and by having the ships stationed here means our troops will get their supplies two months earlier. Today the Cub Scouts are touring the USNS Dahl which is one of the larger military supply ships. This ship can hold 58 Abrams Tanks, 48 other tracked vehicles, and 900 trucks of all types; enough to supply an entire battalion. This ship is very impressive and is just one of many around the world. Having some fun with one of my favorite TV shows. I always wanted House Hunters to do a Saipan episode but that will never happen. If it did, perhaps it would look something like the below video. Which house would you choose? Today we discovered a forgotten American WWII dump site in Saipan. After the Americans secured the island of Saipan from the Japanese, the island was turned into a huge airbase for the constant bombing of Japan. When WWII ended the military bulldozed their equipment, supplies, as well as their garbage into ravines and tried to burry it with truckloads of dirt. Nearly 70 years later the dirt has started to wash away exposing what they tried to get rid of. Below is one of those dump sites. Many of the Japanese WWII bunkers on the beaches of Saipan are so well camouflaged that you don't even notice that they are there. The Japanese often used the same rocks that are natural to the surroundings to make the bunkers invisible from just a short distance away. Two or three months of rain and it doesn't stop for long. I have started building an ark to be on the safe side. Cave and jungle exploring videos have been delayed at least until I get a few more pairs of animals loaded. from around the 60's to the late 80's we were using these runways for 1/4 mile racing strip. Saipan now has an official 1/4 mile track. Lovelly blog...congratulationsssssssssss!! Hugs from sunny Porto....a little city in Portugal! !Today World Heritage--UNESCO site!! U can see my Porto pics too! My wife and I lived in Saipan for 11 years. She was the principal of the Saipan SDA School and I was a teacher there. We just relocated to the U.S. Mainland about a year ago. We loved living there and I really enjoyed looking at your beautiful pictures of the place we still consider home. I came across your website looking for maps that indicate Saipan's location. I wanted to ask if it would be all right if I used your map for a digital book about Saipan that I'm creating for my middle school students. Thanks for your consideration of my request. You can leave a comment on my own blog in reply or e-mail me at maycocksean@hotmail.com. Thanks again. Zapperjohn says Calif could use your rain anytime !